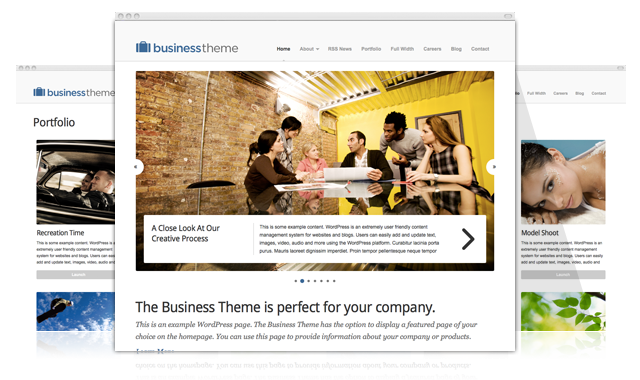 The latest theme added to our repertoire is the Business Theme. Check out the demo here. The theme features a clean, corporate and responsive design perfect for companies that are seeking a beautiful option for both the web and mobile devices. In addition to many of our standard page templates, the Business Theme also includes a page template for posting jobs, and an RSS news page template. The theme contains several color options — the header, background, link and highlight colors can easily be changed to match your brand. The Business Theme is a solid foundation to build your company website upon. We’re so excited about this theme, we even decided to use it for our company, Invulu, Inc. I love the black on white color scheme. Really refreshing in todays web design trends. The background color and link colors can be changed within the theme options, so you can add more color easily. What part of the background change when we apply a different color then the previous? The main white background can be changed, and the gray header background can be changed in the options as well. Clean and simple design, very nice theme!